Our family enjoyed Journey to the Center of the Earth! Can’t wait for us to watch Journey 2 together! Warner Bros. is proud to announce the release of Journey 2: The Mysterious Island on DVD and Blu-Ray; June 5th 2012 along with the Journey 2: The Mysterious Island Blog App! Quiz: Would You Survive The Mysterious Island!? Are you a Wilderness Warrior or a Timid Trekker? Take the Mysterious Island quiz and find out how you would fare in the outback of Atlantis! WIN a Journey 2 DVD! This giveaway will end on June 20, 2012 at midnight EST. Winners will be drawn via rafflecopter. Once a winner is drawn I will contact them and they will have 48 hours to reply before I draw a new winner. Giveaway is open to anyone in the US /Canada and you must be 18 years of age or older. Giveaway not affiliated with Facebook & I release them of liability. Winner will be posted in the rafflecopter widget. Do your kids love bounce houses? Mine do! They can truly bounce all day long! Pump It Up is a place that is filled with different types of bouncing activities including slides and obstacles. Great place to hold a birthday party! 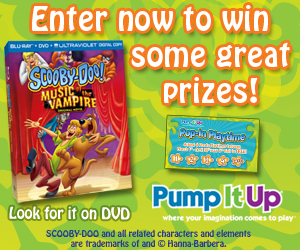 Check out Pump It Up on Facebook because they are giving away a Family Home Entertainment Center (valued at $1,000) plus copies of Scooby-Doo! Music of the Vampire on Blu-ray™. Go Like them on Facebook and enter! We also love Scooby Doo around here! Scooby-Doo! Music of the Vampire (a musical!) is coming to stores on March 13th. The animated feature follows the cartoon gang of Scooby, Shaggy, Daphne, Fred and Velma as they attend a vampire festival and mayhem ensues. I will receive a DVD and was not compensated in any way and all opinions are my own. This giveaway will end on March 19, 2012 at midnight EST. Winners will be drawn via rafflecopter. Once a winner is drawn I will contact them and they will have 48 hours to reply before I draw a new winner. Giveaway is open to anyone in the US and you must be 18 years of age or older. Giveaway not affiliated with Facebook & I release them of liability. Winner will be posted in the rafflecopter widget.